Preheat oven to 450 F. Sift together flour, baking powder, sugar and salt. Cut in butter with a pastry blender, until the mixture has a cornmeal texture. Beat eggs in a small bowl, and reserve 2 tbsp, then beat in the cream. Make a well in the dry ingredients, and pour in the liquid. Combine with a few swift strokes, handling the dough as little as possible. Turn it out on a lightly floured board and pat to 3/4 inch thick. Pat into an 8″ round and cut into 8 to 12 wedges. Place on an ungreased baking sheet, and brush with reserved egg and sprinkle with a bit of sugar. Bake until golden, about 15 minutes. I wasn’t actually sure what I was expecting for this first pass at scone-ing. Because I don’t eat them very often, I was having trouble predicting what their texture and appearance should be. 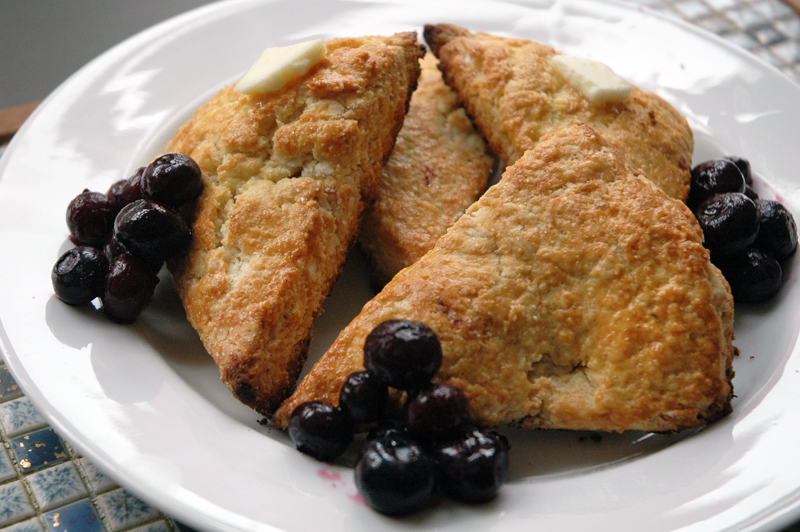 I had planned on making blueberry scones (even getting out a cup of blueberries from the freezer in preparation); however, I forgot to mix them into the batter. Next time! All in all, they turned out to be rich and somewhat crumbly. Tasty with a spot of butter on top. The bottoms turned out a little darker than ideal, but that was likely due to the placement of the rack in the oven (which I’ll raise next time). D noted that a touch more sugar would be nice (the recipe actually mentions that the sugar can be increased up to 1/4 cup if you want a sweeter scone). The addition of something like blueberries or raspberries would moisten it up. I’ll just have to make it again and add something to it! Added an extra tablespoon and 2 tsp of sugar along with folding in blueberries. Also, instead of baking for 15 minutes, I set the timer for 10 and checked on it, and kept it in for another couple minutes. They were just golden but not too overdone. They were crumbly, lightly sweet and delicious. A great improvement!